Buy online from the high street chain. Find beds, mattresses, duvets, bedding, cushions, throws and ready-made curtains. Follow Ponden Home Interiors to get news updates on your homepage. Ponden Home Interiors is being followed by 0 people. UK Delivery Details: Standard delivery £3.99. Free click and collect. Furniture delivery £9.99 for delivery within 14 days. Ponden Home Interiors has 25 stores in the UK in our database. Ponden Home Interiors is currently ranked 852 in the directory. Last month its rank was 1115. A Special Offer was added for Ponden Home Interiors: Up to 50% Off Warm Winter Quilts ... 56 days ago. A Special Offer was added for Ponden Home Interiors: 50% Off Flannelette Sheets and Duvets Sets ... 56 days ago. A Special Offer was added for Ponden Home Interiors: 50% Off Christmas Products ... 56 days ago. A Special Offer was added for Ponden Home Interiors: Up to 50% Off Thermal and Blackout Curtains ... 56 days ago. A Special Offer was added for Ponden Home Interiors: 50% Off All Hotel Luxury Collection Curtains 56 days ago. A Special Offer was added for Ponden Home Interiors: 20% Off Selected Kylie Minogue ... 56 days ago. A Special Offer was added for Ponden Home Interiors: Catherine Lansfield Bed Linen ... 56 days ago. A Special Offer was added for Ponden Home Interiors: Up to 50% Off Selected Duvet Sets ... 56 days ago. A Special Offer was added for Ponden Home Interiors: Sleep Sound With Up to 50% Off Pillows ... 56 days ago. 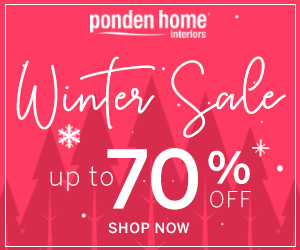 A Special Offer was added for Ponden Home Interiors: Up to 50% Off Winter Warmers ... 56 days ago.